Inaugural event featured a wide variety of current topics covered in series expert panel discussions. 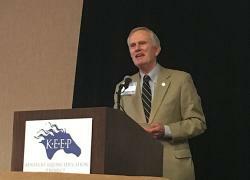 LEXINGTON, Ky. — Now that the Kentucky Equine Educational Project’s first KEEP Equine Industry Conference is in the books, plans are in the works to make it an annual event for the commonwealth’s multi-breed horse industry. At total of 156 people registered for the conference Tuesday at the Embassy Suites hotel. The four panel discussions featured speakers working in an array of breeds and disciplines, reflecting the diverse nature of those in attendance. A prime example: Everyone who owns, raises or boards horses of any type would benefit if the industry is successful in securing the exception from the 6-percent state sales tax on feed and equipment granted to other livestock. Clabes pointed out that issues such as infectious disease and animal welfare impact all breeds, and that joining together might even work toward a larger insurance pool to coverage on not only jockeys but riders of other performance horses. Enthusiasts of the Tennessee Walking Horse at the conference cautioned that regulations targeting one breed can impact others. They said a proposed federal regulation aimed at ending the practice of “soring” a horse’s feet and legs to force an exaggerated gait might have good intentions but also unintended and unfortunate consequences, including for other horse pursuits. Former Kentucky governor Brereton C. Jones, the master of Airdrie Stud who was KEEP’s first chairman and co-founder, was feted with the organization’s first Vision Award for an individual. Michael Blowen, founder of the popular Old Friends racehorse retirement facility based in nearby Georgetown, Ky., with satellite facilities at Kentucky Downs and in Saratoga Springs, accepted the Vision Award for an organization. Blowen applauded the efforts of the Horse Country initiative to open up Kentucky’s farms and horse facilities to visitors. Presenting the awards was Corey Johnsen, the Kentucky Downs president and part-owner who followed Jones as KEEP chairman. Clabes said he was not surprised by the upbeat tone of the conference, a contrast to marked declines in some other racing jurisdictions. He said one factor is the emergence of historical horse racing, the innovative technology that provides bettors an electronic experience but is parimutuel in its structure — and therefore the domain of the racetracks. Historical horse racing allowed Kentucky Downs to offer almost $8 million in purses and Kentucky-bred purse supplements for its record-setting five-date meet last month, along with transferring a game-changing $1.35 million into purses at Ellis Park, whose own historical horse racing has been picking up. Keeneland and The Red Mile harness track began partnering last year on historical horse racing in Lexington, with the state approaching $2 billion in betting since Kentucky Downs launched its first terminals in 2011. Turfway is working on a plan to install the machines. While historical horse racing benefits the thoroughbred and standardbred racing industries, the sales tax on stud fees helps other established breeds in the state through the Breeders’ Incentive Fund. Ted Nicholson, who a year ago became senior vice president and general manager of Kentucky Downs, was on the equine industry economic reports panel. He said that Kentucky Downs’ average of almost 11 horses per race “is three more horses a race than what most racing secretaries are dying for today” — thanks to historical horse racing that has pushed purses to among the highest in America. Conference attendant Chip Bach, general manager at Turfway Park, said track ownership continues to work on plans to install 250 historical horse racing terminals. Turfway’s ownership is Jack Entertainment, which also owns a casino off downtown Cincinnati. “We don’t have an adversarial relationship with the biggest property in the area, which is a good thing for us,” Bach said. “I believe that river going across the Ohio is like 500 miles wide. People don’t like driving over it, and we have a fairly significant population in Northern Kentucky. I think from a casual basis, Turfway Park is going to be able to attract some people who don’t want to drive to Indiana or drive into downtown Cincinnati. Bach said the Northern Kentucky track continues to seek out the best formula for how many days a week to race. The track faces the most severe competition for the discretionary dollar, from nearby casinos to the Cincinnati Bengals, of Kentucky’s five thoroughbred tracks. Bach said that Turfway plans to run five days a week in December, Wednesday through Sundays, for the first time in years. Turfway will drop Sundays in January and February and go to three days a week in March, he said. Price Bell Jr., a fourth-general horseman from Lexington, was among those stressing the importance of individual contact, whether to create fans or educating legislators on issues impacting the horse business. Bell helped found the Horse Country initiative formed in 2015 by industry stake-holders to give the public an up-close look at Kentucky’s farms and veterinary facilities. Horse Country is patterned after the highly successful Kentucky Bourbon Trail to promote the commonwealth’s other signature industry. He said that includes celebrating and rallying around their care after horses’ competition days have concluded. An up-close approach also is paramount with elected officials, other speakers said. Ryan Quarles, Kentucky’s Commissioner of Agriculture and a former state legislature, said those in the industry must get to know their legislators. Dr. Jill Stowe, associate professor in the University of Kentucky’s Department of Agriculture Economics and director of the UK Ag Equine Programs, provided statistics from the 2012 survey on the state’s horse industry, the first comprehensive study since 1977. The survey determined there were 35,000 equine operations in the state with at least one horse in residence, totaling 242,400 equines (which include mules and donkeys), accounting for 40,665 jobs, 1.1 million acres devoted to equine use and with the value of equines and equine-related assets totaling $23.4 billion. Stowe said UK now plans to conduct such a study every 10 years. Tom Biederman, of Biederman Real Estate and a noted equine auctioneer, said that the presence of the super wealthy among Kentucky’s horse farms is “a great thing” but that “we need to continue to help the small family farmer. Chauncey Morris, Executive Director of the Kentucky Thoroughbred Association and Kentucky Thoroughbred Owners & Breeders, said statistics show that the breeding industry is in recovery mode over the beat-down of the post-2008 market meltdown. He said that more than one-half of all the thoroughbred mares in the America two years ago were bred to one of Kentucky’s 278 thoroughbred stallions, no matter where the resulting foal was born. Morris pointed out that as the American foal crop has dropped significantly, the Kentucky-bred crop has been far more stable to where it now reflects about 36-percent of the foal crop. “Are we in recovery mode? The statistics say we are,” Morris said. New Executive Director Laura Prewitt said the Kentucky Horse Park declined to bid on the 2018 World Equestrian Games because of the timing but hopes to land the 2022 WEG. The Horse Park was host to the 2010 WEG, the first time it was held outside Europe. Some symposium participants mentioned the competition for shows facing the state-owned Horse Park from North Carolina’s privately-owned Tryon International Equestrian Center. Kentucky Horse Racing Commission Executive Director Marc Guilfoil, speaking on the legislative and regulatory panel, emphasized the need for “feet on the grounds security” at racetracks and said the technology has gotten cheap enough to install state-of-the-art camera systems on the backside. “Not getting them too much into somebody’s shed row but sort of a broad spectrum and you go from there,” he said. He called the goal of uniform medication a “great” objective but said that first the laboratories conducting the equine testing must use identical equipment and protocols. Other panelists and moderators included Dr. Stuart Brown of Hagyard Equine Medical Institute; Norm Luba of the Kentucky Quarter Horse Association; Mistee Wrigley-Miller of Hillcroft Farm, a prominent competitor on the Saddlebred circuit and the sport of combined driving; Topline Communications’ Jen Roytz; Reese Koffler-Stanfield, owner and head trainer of the Maple Crest Farm dressage facility; the Kentucky Horse Council’s Katy Ross, and Rusty Ford from the Office of the State Veterinarian. “Where we are today isn’t where we were eight or nine years ago,” said Capps, who has worked in an array of capacities in the sport, including as Maryland Jockey Club executive vice president. “We went through a very difficult time, the most difficult in my lifetime. If you heard the conversion that went on today — from the audience as well as up here — you heard people talk about good things, exciting things new things.